Hey-o! Today I've got some swatch photos and a review of the super-hard-to-find L'Oreal "Masked Affair" from the Dark Sides of Grey collection. It seems like the nail polish world is obsessed with this shade and I have to say... I'm riding that hype train. Anytime a mainstream company puts out a true linear holographic shade/collection I get excited. 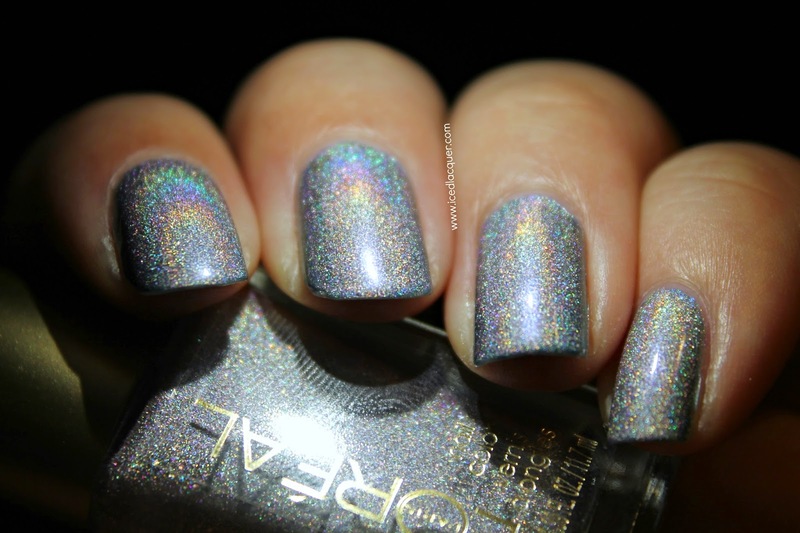 I think the last good one was the Color Club Halo Hues and those shades are still my all time favorite linear holos. So how does "Masked Affair" compare? Let's find out. What makes this silver linear holo so different? Well in my opinion, it's the flakes. Back in 2013 L.A. 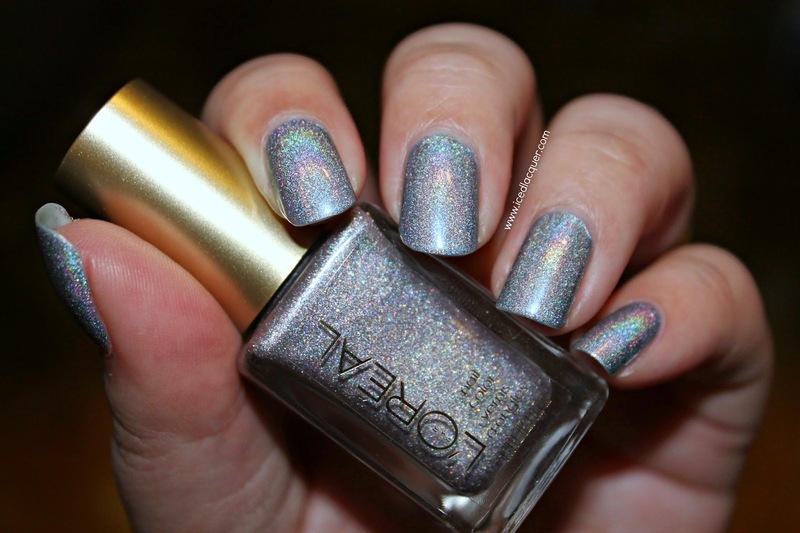 Girl released a collection of colored jelly polishes filled with silver holographic flakes. 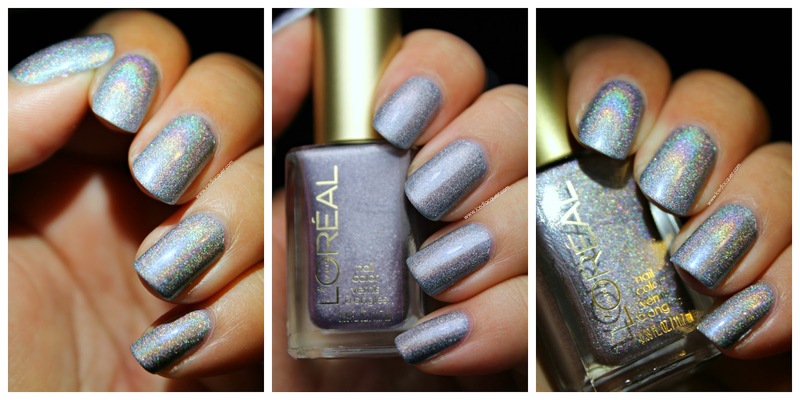 Zoya also released some very similar shades ("Blaze," "Dream," "Aurora," and "Storm"). Many of Picture Polish's shades also feature those same holographic flakes, although the bases are usually more of a scattered holo. If you look really closely at my photos (especially the macro above) you can see those tiny, irregular holographic flakes mixed in with the linear flare. The result is an extra sparkly linear holographic nail polish, which is just the cherry on top if you ask me. These two photos (above and below this caption) show how the linear holo comes alive in LED light. 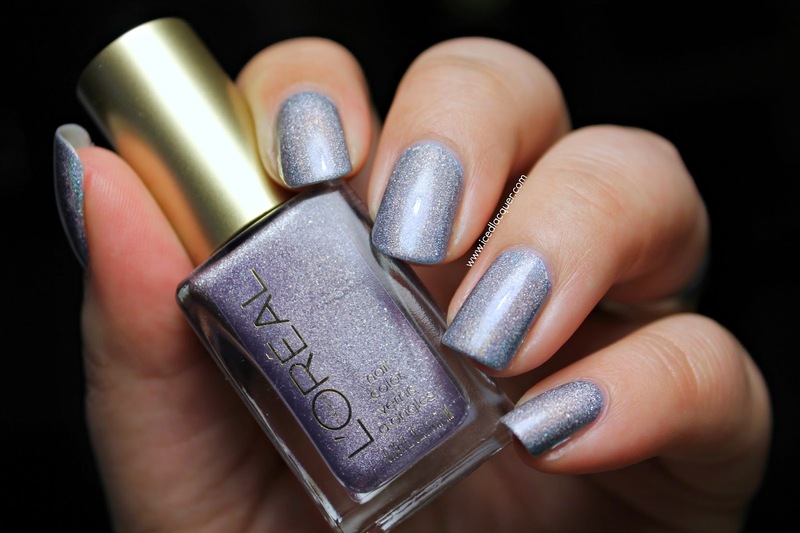 In the photo above you can see how much lighting really changes this polish. The first and third are in LED lighting and the middle is in my normal photo lighting. You can see that indoor lighting also brights out a bit more of that lilac tone. My opinion: I'm still angry at L'Oreal for 1. making this a limited edition polish and 2. only putting two of each polish in the little plastic displays. Every time I went into a Rite Aid, Walgreens, or Fred Meyer during the past month I would check for this display. The first six times I found the display but no "Masked Affair." It took me seven stores to find this! So basically what I'm saying is if you want this polish and happen to see it don't hesitate. I could also ramble on about how irritated I am that people are hoarding bottles of this and selling it for two to three times the price, but I won't. (Maybe I'll save that for a Nail Newscast topic? :P) Anyway, none of that really has to do with the bottom line which is this polish is beautiful and unique and I absolutely recommend it. What are your thoughts? This is phenomenal! It looks stunning on you. Just enough of a purple shift to make me really fall in love with it.